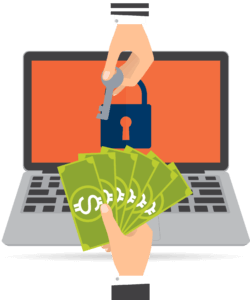 Research done by the Ponemon Institute found that 54% of organizations fell victim to Ransomware in 2017, or those victims the majority paid the ransom, which on average was $3,675. A similar report found that in 2017, Ransomware hackers made $301M in ransom and that 15% of the victims that pay that ransom still never recover their data. The monetary value of the ransom is usually secondary to the costly effects associated with these attacks, which often leave businesses with lost data and downtime that makes it impossible for the company to carry out its day-to-day business. Online Safety Training: Some threats are easy to spot if you know what you’re looking for. A knowledgeable MSP can provide tips to walk your employees through basic online safety training that can help them steer clear of phishing attacks and learn how to proceed if they think they’ve been infected. Keeping Data Safe with Regular Backups: Ransomware attacks by holding sensitive information hostage in exchange for payment. If your system does get infected, you’ll still need to remove the virus, but you’ll have peace of mind of knowing that your data can be safely restored from a recent backup. Defending Against Ransomware: There are a number of tools used to stay on top of the latest malware. MSPs are consistently being trained on the latest security technology and can use it to help defend your system against attacks. Identifying and Eliminating Threats to Your System: As malware continues to advance, the reality is that sooner or later it’s likely to make its way into your system. When that happens, you want to be working with someone that knows how to locate the threat, identify what it’s after, and remove it from your system. Developing a Disaster Recovery Plan: When disaster strikes, a qualified MSP that’s familiar with your business can ensure you’re prepared with a recovery plan specific to your needs, resulting in minimal interruption, even in the event of an attack. The threat of malware can be overwhelming, but we’re here to help. OTELCO’s Backup as a Service is a business continuity, disaster recovery solution. It was designed to prevent disasters by planning for the worst and defending against them. BaaS from OTELCO Cloud and Managed Services can protect you from Ransomware, by detecting hackers before they attack and protecting your data from them when they do.